Home Forums Mechanical Turk Daily Work Threads 04/01 - Silly Sunday! Discussion in 'Daily Work Threads' started by TissueHime, Mar 31, 2018. Is there a good OTC one? Benadryl works for some, but it doesn't really make me sleepy at all (I take it for seasonal allergies). You could try it. Duct tape a running vacuum to the ceiling. aveline, <Gucci> and ducky like this. Kerek and <Gucci> like this. Ugh, parties. Even reading the word feels like too much effort. <Gucci> and ducky like this. Kerek, <Gucci> and aveline like this. turkleton, Kerek, Barbwire and 4 others like this. ducky, Kerek and aveline like this. Okay, I'm off to and maybe . Night night, lovelies. Kerek, jklmnop, <Gucci> and 1 other person like this. Barbwire and Kerek like this. ducky, <Gucci> and aveline like this. ducky, <Gucci> and Kerek like this. Because I am a bit mean, I love the part at about 1:20: Man: You don't know us. 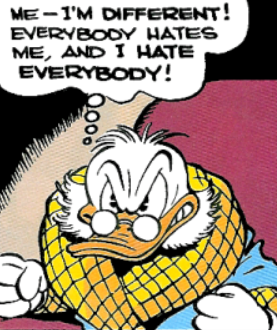 Scrooge: Nor do I wish to. <Gucci>, Kerek and aveline like this.